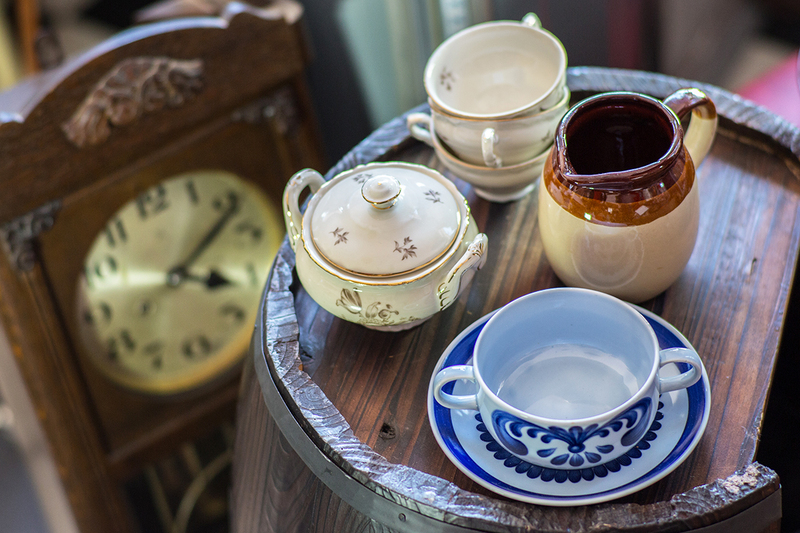 Old antique cups on a barrel in a second hand store, with a clock in the background. If you’ve ever seen those “estate sale” signs on street corners and wondered if they’re really worth your time (they’re just a bunch of old junk no wants anymore, right? ), you’re not alone. My husband and I are avid garage sale shoppers, and while we’ve visited plenty of estate sales in our time, we didn’t realize until conducting research for this very post that we’d actually held an estate sale of our own this past summer. The phrase “estate sale” brings to mind things like wills and musty antiques. But in reality, estate sales can cover many circumstances beyond the death of a homeowner. Here’s the lowdown on what they entail and how to run a successful estate sale of your very own. Don’t let the funereal term “estate” fool you; an estate sale simply refers to the selling, en masse, of most of someone’s possessions. Think of it as a garage sale on steroids. When my husband and I sold our home last summer and moved into an apartment, we realized we’d accumulated more stuff than we needed. In keeping with our overall desire to live simpler, we opened our home to bargain hunters and sold about 95% of our no-longer-wanted possessions, from tiny items like picture frames and candles to big-ticket items like furniture and a wide-screen TV. It was liberating — and gave us a nice chunk of change for the next step in our journey. Walk through your home and make a list of everything — yes, everything — you plan on including in the sale, as well as any items you won’t be selling. Divide this inventory into categories by room, and make a note of each item’s condition on a scale of poor to like new. This will help you when it’s time to research prices and determine where things will go during the sale. Go online, look at catalogs, and take items to an antique dealer if necessary to get an idea of their fair market value. Bear in mind, like garage sale shoppers, estate sale shoppers are out for a deal. If you’re wavering between two reasonable price points, it’s not a bad idea to mark an item at the higher of the two — you’ll find that whatever price you put on the sticker, most people will try to haggle you down. If you’re having trouble pricing certain items, check out this large list of pricing resources. You want buyers to browse each room at their own pace without any bottlenecks forming, so try to keep items to the perimeter or center of each room, and don’t clutter tables with too many items. Shoppers should be able to glance over your things and keep going if they’re not interested, and you want enough room for a few people to stand and deliberate without holding everyone else up. Put a large “Not For Sale” sign on any items you don’t want people to buy. Be forewarned, however, that this doesn’t always deter gung ho bargain hunters. When my husband and I had our moving sale, so many people asked about certain clearly marked items, we wound up hiding them in the bathtub to stop the madness. If possible, put all off-limit items in one or two rooms, and keep those sealed from browsers to avoid confusion. Never leave an entrance or exit open and unattended. You and your helpers should be able to monitor everyone who comes and goes to ensure no one leaves without paying for their items. Rope off off-limits areas, and post someone to enforce those boundaries. Close and lock doors you don’t want people opening. Keep your cash and loose change in a secure lock box and under constant supervision. High-value small items, like jewelry, are best kept at the cashier’s table so they’re always within sight. Take pictures of the items most likely to get people in the door. Big items, like furniture and appliances, always interest potential customers, as do collectibles, like antiques, comic books and sports memorabilia. Make sure your photos are clear, well-lit and visually appealing. Place ads in local town, city and village papers a week before your sale, as well as on any online classifieds for your area. Don’t forget Craigslist, where you can list under the “garage sales” category (be sure to specify “estate sale” in the headline to get more attention). Whenever possible, place plenty of pictures in your ads to give people a better idea of what they’ll find. From cashing people out to loading big items into customers’ vehicles, it’s best to have lots of helpers to keep you from being pulled in too many directions the day of the sale. Offer to pay them in food and beverages, and throw a pizza party at the end while everyone pitches in to clean up. Call area donation centers ahead of time to find out what their policies are on large donations. If you have a lot of unsold items, you may be able to arrange a truck to come pick them up at the end of the sale, or you can assign someone to take them to a drop-off location. Never leave large piles of garbage or recycling on your curb without calling your town’s waste management provider first for permission, or you could incur a fine. I’ve learned the hard way that pianos are infamously hard to get rid of. They’re cumbersome to move and transport, often require a rental truck and most times need some professional tuning or other repair. If you’re including a piano in your estate sale, prepare to price it to move and consider contingencies, like Freecycle or calling up local retirement homes and schools to see if they’ll take it for free. Your Turn: Have you ever held an estate sale? What other tips would you give?